LIT SOFTWARE is offering the Ultimate Litigation Bundle at a big discount for the last week of 2018! This is the last opportunity to download our app bundle (TrialPad, TranscriptPad, and DocReviewPad), or complete your bundle, at a significantly reduced price. The cost will be $249.99 for all three apps! That's a savings of $50.00 if purchased separately. We're incredibly proud that our apps have been ranked 5️⃣ and 6️⃣ on the list of the most popular apps in the 2018 ABA Technology Survey! Read all about the survey in iPhoneJD.com’s recent blog post. It's been no secret that we'll be transitioning to a subscription model, we announced it over a year ago. We've been working on the best solution for our customers, and believe we have a win-win situation for both our users and LIT SOFTWARE. It will allow our development team to grow alongside our user base, provide even better customer support, add user requested features and improvements more rapidly, create better support and training documentation, and continue to provide the same level of quality and reliability you've come to expect from us. All this will make LIT SOFTWARE the platform you can rely on for all your litigation software needs. With a subscription our users won't have to worry about upfront costs, or whether the the app they just purchased is at the end of its lifecycle, or having to wait for major updates to get new features (the apps will be updated as new features become available). There also won't be any maintenance or support costs (which is a favorite of the traditional software vendors ). We're going to offer a simple annual subscription for all our apps which means the cost can be budgeted, and you'll always be receiving the latest new features and improvements. SO WHAT'S COMING AND WHEN? We've been working on big updates to TrialPad, TranscriptPad, and DocReviewPad. There are too many new features and improvements to list here. Just know that we've read every support email you've sent, listened to all your feature requests, and taken your critiques seriously. This subscription will be called the LIT SUITE™, and this is where all our development efforts will be focused going forward. So when we introduce a new feature (or a new app ) it will only be available to our LIT SUITE members. The existing versions of our current apps will be sunsetted over the course of 2019, and they'll be replaced by the new LIT SUITE apps. Our existing customers of our current apps will be able to take advantage of a special discount when they sign up for the LIT SUITE membership. So if you've been considering trying out our apps, or you're an existing user wanting to complete your bundle, feel free to take advantage of this offer. We are very excited about what we’ll be able to offer with the LIT SUITE, and hope you’ll stay tuned as we make some great announcements over the coming months. Featured Pro: Michael Beckelman, Esq. Michael Beckelman is a Partner in the Houston office of Wilson Elser, a regional chair of the Complex Tort and General Casualty practice team and co-chair of the firm’s Design Professional practice. As a litigation supervisor, he works on and supervises approximately 100-120 active files. A couple weeks ago Michael reached out to LIT SOFTWARE for more information regarding our apps and to discuss how they have made his practice more mobile and more efficient. The first time Michael used TrialPad was about five years ago in a deposition in a construction defect case. At the time, none of the 15 or so parties attending the deposition had seen anything like it. Even the large conference room was crowded, and when everyone was jockeying for the best viewpoint to simultaneously view a 2’x3’ architectural drawing that was the subject of the witness’s testimony, Michael suggested TrialPad. He had previously loaded a PDF of the same drawing onto TrialPad, and brought it up on the conference room screen. Within a few minutes, everyone was back in their chairs. He was able to zoom into details of the drawing and call them out without losing resolution. The laser tool allowed the witness to easily specify each portion of the drawing he was discussing. Moreover, the witness was able to mark the drawing up. In the end, the marked up exhibit on TrialPad was emailed to the court reporter for inclusion in the transcript as an exhibit. Already a believer in the mobility of the iPad, Michael was now also sold on the capabilities of TrialPad. While TrialPad can hold all your documents, pertinent case law, videos, etc., TranscriptPad can be your best reference for every transcript in your case, including deposition testimony, hearing transcripts, and previous or related trial records. With both on your iPad, you will have everything you need to argue in any hearing. A case where this worked particularly well for Michael involved the plaintiff attempting to use a business record affidavit hearsay exception to get a root cause report admitted into evidence. Michael was opposed to the admission of the evidence and contested admission of the evidence based upon the trustworthiness of the conclusions. The judge requested evidence that the conclusions were not trustworthy. Prior to the hearing, Michael created an Issue Code within TranscriptPad for exactly this purpose, and was able to create and print a detailed PDF report for the judge within seconds. Impressed with his preparation and speed, the judge reviewed the TranscriptPad issue code report, and ruled in his favor precluding the admission of the contested evidence based upon the substance of the report provided from TranscriptPad. The forum in which Michael presents with TrialPad most often is in mediation. Like most modern conference rooms, most mediation locations have plug-and-play technology, allowing Michael to show up, connect, and present. 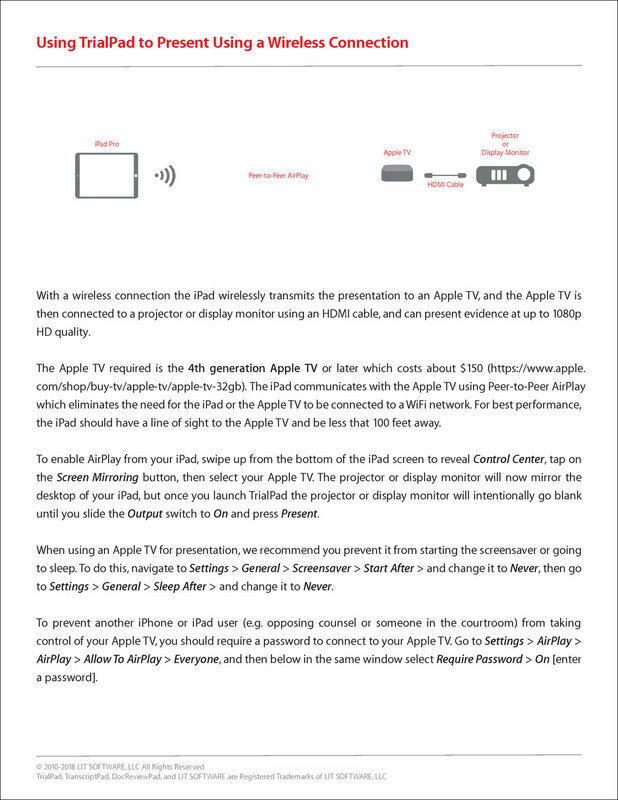 In a recent commercial auto accident matter, Michael used TrialPad with an Apple TV to present to the mediator and all parties. Everyone was always on the same page, whether reviewing a document or a photo, and the mediator’s questions were quickly addressed and answered as documents detailing Michael’s case were brought up on screen. As impressive as TrialPad is in court, it has the same effect in mediation. Most mediators still expect a slide presentation, PowerPoint, or saved PDFs, but Michael has used TrialPad to keep mediations dynamic and persuasive by quickly referencing and presenting relevant and persuasive documents, and highlighting relevant and persuasive information through callouts, highlighting, and annotations. Mediators love it. Michael’s practice is diverse and constant, and often requires travel. The ability to work anywhere, and bring everything important to your practice with you is important. Michael’s mobile law practice no longer includes a laptop. Instead, he brings two iPads, which are more easily carried and set up, and hold a charge for longer. Transferring files between iPads can easily be accomplished with with AirDrop, eliminating the need for thumb drives as well as laptop charger cables, and angry looks from flight attendants eager to shut down laptops, but happy enough to allow tablets of any kind. Between DocReviewPad, TranscriptPad, and TrialPad his entire case file can be accessed at any time he needs to reference a document, transcript, or video. Michael uses two iPads as a dual monitor workstation. This means that even on a plane, he can have a document open on one iPad, and draw up a response document using Word on the other. Document drafts that need to be emailed can be placed in queue, and will be sent as soon as the iPad has connectivity, which means he’s working even as he walks off the plane. Last time he went to trial, he left his laptop in the office, and brought two iPads and an Apple TV to court. No binders. No paper. While everything he expected was important to the case was brought into TrialPad, ready to present, the entire case file was stored within DocReviewPad, ready for easy export to TrialPad for presentation if necessary. DocReviewPad creates and maintains your Bates control, and allows for document culling and production prior to trial, but also works as the new electronic binder of the entire case record in court, allowing Michael the confidence of knowing that anything he could possibly need to reference, was a couple taps away. In trial, TrialPad works as Michael’s trial binder, holding all important evidence, organized into folders by witness or issue, and ready to present when necessary. The iPad and key apps like LIT SOFTWARE’s DocReviewPad, TranscriptPad, and TrialPad have allowed Michael the freedom and ability to practice with confidence in any location and any forum. Download LIT SOFTWARE apps for your practice today. If you practice law in Arizona, you’ve probably heard of Brian Snyder of Snyder & Wenner. He’s made legal news, and set verdict records for Arizona in the past few years, among them the largest verdict in Arizona of any kind in 2017, and, in a separate case, the largest verdict against the Veteran’s Administration. His case load is 98% document- intensive, complex medical malpractice work and trucking accident litigation, and requires sophisticated presentation technology for trial. To present his record-breaking cases to judges and juries, Brian uses TrialPad. Brian has been using TrialPad in trial once or twice a year for the past four years. He has been in courtrooms where opposing counsel have hired trial technology teams, or rented expensive touch screen monitors, and experience has shown him that using TrialPad was easier, and worked better. There was no need to communicate to a team about what needed to be put on screen or highlighted, and there was no need to walk across a courtroom to a touch screen monitor or an Elmo/overhead projector to present a document. Presenting using TrialPad is straightforward, putting the technology in the background and allowing the judge and jury to concentrate on the argument and on what is being presented - not on how it is presented. To create linear presentations, Brian uses the Snapshot tool in TrialPad to screen grab documents for opening and closing. Using the Callout and Highlight tools in conjunction with the Snapshot tool in TrialPad is an easy way to prepare documents for insertion into a Keynote presentation, or a TrialPad folder. Brian uses a different iPad for every matter, loading all exhibits from each case onto its own iPad. All documents live in DocReviewPad until a couple weeks before trial. Prior to that, Brian uses DocReviewPad to sort documents, and find issues in the case. As the case progresses, all depositions are loaded into TranscriptPad, and the iPad comes with him to every subsequent deposition. TranscriptPad allows him to search the entire record of testimony, find issues in the case, and cross examine witnesses in deposition and in court. As trial approaches, Brian loads all potential evidence to be presented into TrialPad, and begins organizing for opening, closing and witness examinations. Natasha Gellatly, owner of NG Solutions in Vancouver, WA, recently shared with us her unique business model, and how she uses LIT SOFTWARE’s apps to improve litigation practices in the Pacific Northwest and beyond. Natasha started her company out of her experiences in her career as a litigation paralegal. For many years, she was employed in a large firm in Portland, Oregon, where she became the go-to paralegal for any attorney headed to trial. She spent years preparing and presenting at trial. Then, four years ago, she tried a new type of presentation software—TrialPad. TrialPad revolutionized the way she approached trial preparation and presentation. More than anything, it made her desk space almost irrelevant as she could perform many trial preparation tasks on her iPad, regardless of location. TrialPad even made some tasks easier and faster than before, such as preparing documents with exhibit stickers. Applying exhibit stickers to, for example, 400 documents by hand, or even applying them using a program like Adobe’s Acrobat to open and electronically annotate the documents took her much longer before TrialPad, which accomplishes the same task in about 10 seconds. And when the exhibit stickers (invariably) have to be re-done because a document was added mid-sequence, TrialPad re-labels them all equally as quickly. Over time, the exhibit sticker feature alone saved her hours of work, freeing her up for other tasks, and adding up to significant billable time savings for grateful clients. In short order, Natasha also added TranscriptPad and DocReviewPad to her iPad, and her iPad became her new mobile workstation. After a couple of years of iPad trials, Natasha took the knowledge and experience of large firm litigation and started a company of her own. Through NG Solutions, Natasha now trains lawyers and paralegals in the easiest and most efficient ways to prepare and present at trial using only an iPad. She also offers trained paralegal staffing for those pre-trial moments when extra hands are needed. In short, NG Solutions has become the life ring that small and medium sized firms often need when headed to court. For Natasha, preparing and presenting at trial involves using the LIT SOFTWARE bundle, not just TrialPad. She told us that using all three apps’ different abilities to access a case is a HUGE additional tool at trial. The three apps work together on the iPad become your entire workstation. Use DocReviewPad to process, Bates label, and redact and to start organizing documents around the issues in your case. Then transfer only what you think you’ll need to present to TrialPad. She reminds her clients that transferring additional documents from DocReviewPad to TrialPad if needed is quick, and doesn’t require an internet connection, as it all happens within the iPad ecosystem. The same app to app transfer can be done with TranscriptPad, as deposition summaries and Impeachment Reports can be brought into TrialPad to show a witness in a matter of seconds. All three apps have tools to keep track of what you’ve already done, so you don’t have to duplicate your efforts. DocReviewPad saves a report every time you make a production set. Keeping those reports will let you know exactly what you produced to the other side, or transferred into TrialPad. TranscriptPad reports can be saved in the same folder as the transcript so that if you’ve reviewed it, and then put it down for a couple months, it is easy to read your summary and pick up exactly where you left off. Additionally, Issue Codes saved in both DocReviewPad and TranscriptPad also allow you to see exactly what issues there are in a case if you open it after several months continuance. Lastly, Evidence Reports in TrialPad help preserve the case record for appeal, noting documents, exhibit numbers and admitted status. Natasha recommends taking a couple seconds (literally) after each day of trial to create an Evidence Report. Natasha teaches the art of the iPad Trial to lawyers and paralegals, and has had a fantastic response from her clients, as well as the judges and juries in court. An iPad trial is easy to learn and implement, and saves time for the firm, and money for the client. Law firms are also happily surprised to find that all three apps cost under $300! Together with Natasha’s experience, the three iPad apps allow firms to take on more clients, confident in a proven system she’s shown them how to employ. Judges and juries recognize the high quality of the presentations, and appreciate the amazing capabilities of the apps that allow the trial team to be efficient and nimble in presenting and responding in the courtroom. Get the Ultimate Litigation Bundle on your iPad today! Cari Pines is a Family Law attorney practicing in Southern California. If you know her, you know she’s a dynamo. Upon meeting her, you get the distinct impression that she’s unstoppable—a great asset for a family law attorney, and especially important to the clients she represents. Part of that impression comes from the huge amount of work she does, not just for clients, but for other attorneys in advancing the cause of technology and efficiency in law and client representation. Family lawyers in California previously weren’t afforded much trial time, they worked by declarations and written pleadings. But there has been a shift over the last few years. California law now entitles more litigants to evidentiary hearings. This change has seen family law attorneys, retraining and retooling their practices. Judges in California have asked bar associations to train family law attorneys on how to introduce and use evidence during evidentiary hearings. Cari is at the forefront of that effort, as is the iPad and LIT SOFTWARE’s apps. We talked with Cari at the ABA TECHSHOW this past spring, and then again just a few weeks ago, about her efforts in bringing technology to the practice of Family Law, and also about how she uses technology in her own practice. While it’s true that Cari uses LIT SOFTWARE’s apps in the conventional ways they were designed for, she talked to us about some of the additional ways she uses their features and capabilities to streamline her practice and her busy speaking schedule. It all begins with DocReviewPad. First, Cari imports every single page of discovery, and assigns Bates stamps to have her own Bates control. She told us that one of her favorite things about DocReviewPad happens when she teaches people how to use it for Bates Stamping. When they see first hand how it can easily assign Bates numbers to hundreds of documents with thousands of pages in only a couple seconds, she invariably gets to watch their mouths drop. Cari recently used DocReviewPad as her main e-discovery tool to review a huge production of a party’s employer correspondence regarding compensation. She found emails that were integral to establishing the party’s value in the divorce proceeding, including documentation of payroll, insurance compensation, and even previously hidden client contracts. All of that key correspondence was assigned Issue Codes within DocReviewPad and easily exported to TrialPad, where it was automatically sorted into Key Doc folders—ready to bring up during the client conference or in deposition. Anything not imported into TrialPad is still available and searchable on her iPad anytime, and can be sent to TrialPad for presentation in seconds. At the outset of a matter Cari is loading elements of her case into TrialPad. Cari sets up a TrialPad case not just for evidence, but also for pleadings and court orders so that the entire case is with her all the time. This allows her to move from the office to a meeting to a courtroom as needed, while still able to discuss a case and specific documents and issues with a client or associate any time by simply opening an app on her iPad—a much simpler and faster process than opening and loading a laptop. After going through DocReviewPad and finding key documents and issues, she imports them into a case that already exists. Rather than picking up DocReviewPad, and then putting it down once the case is in TrialPad, she uses the apps fluidly, going back and forth according to her need and the strengths of each app’s features. For Cari, TrialPad is her main tool for courtroom presentation of evidence, but she also uses it to discuss a case with a client, while creating pleadings, for deposition, and to present slides at conferences. Cari constantly reviews the entire file in TrialPad, so she knows exactly where all her documents are, she has them with her at all times, and she is able to respond quickly and efficiently whenever needed. As she reviews, she organizes evidence into folders according to important issues. When there are key portions of a page or document, she uses the callout tool and snapshot tool so that the important part of the page is immediately front and center when she opens it. When it comes time to conference with the client, she knows every issue and the relevant information to discuss. Those same snapshots come in handy again when it is time to create pleadings. Cari exports the document snapshots and pastes the images into the pleading document. She has done this with support calculations, police reports, photos, etc., often also placing two documents side by side and calling out the relevant portions of each. This practice has been key to illustrating important issues for judges as they review, for example, a Prayer for Relief. These screenshots are also pasted into slide decks for courtroom presentations of opening statements or closing arguments. When it comes time to take depositions in a case, Cari creates a brand new TrialPad case just for deposition and includes pleadings, notes, exhibits, and anything she thinks she will use. She copies and transfers that case onto several iPads, and hands them out at deposition, one for opposing counsel, one for deponent, one for the court reporter, etc. Then, everyone can bring up the exact same documents at the same time. When the witness comments on “Exhibit 134”, Cari applies an Exhibit Sticker in TrialPad and emails the exhibit to the opposing counsel and the court reporter on the spot. No more bringing binders to deposition. She’s brought up to 6 iPads to a deposition, with every possible document she might use, and it was still lighter than one of the deposition binders she used to bring. Plus, it is faster and easier to keep everyone on the same page, looks professional, and yes, maybe a little intimidating. After depositions and hearings, all transcripts are copied to TranscriptPad. There, she again assigns Issue Codes, and exports key pieces of testimony as PDFs into TrialPad—the hub of her case—using the Impeachment Reports. As a matter progresses, Cari continues to add evidence to the TrialPad case. If and when it comes time to create and submit an Exhibit List to the court, she saves time by simply printing the Evidence Report in TrialPad. The Evidence Report becomes her Exhibit List, and requires only a caption page before filing. During the course of a matter, Cari’s iPad is used for case-specific client storage and is ready to refer to or to present at a moment’s notice. This efficiency is especially important, since, in addition to running her own firm, Cari does a lot more in and around the Southern California legal community. She volunteers on the board of a not-for-profit legal aid law firm, is the incoming Chair of the Family Law Section for the Los Angeles County Bar Association, serves on the California State Bar’s Law Practice Management and Technology Section’s Executive Committee, and regularly presents at family law conferences, at colloquia, and at symposia. And she uses TrialPad for those legal conferences and speaking events too. Cari creates slide show presentations, turns them into PDFs, and uses TrialPad to present them better than if she had done so in the native program, as she can zoom in, call out and highlight doing the presentation. Start using LIT SOFTWARE apps today!